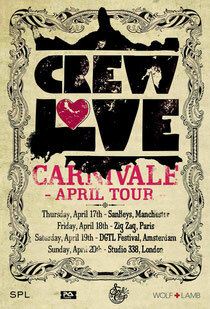 To celebrate the launch of the new subscription site, crewlove.us, every artist on the Crew Love roster fronted by Soul Clap and Wolf + Lamb will hit the road across Europe on a double decker bus tour equipped with a full mobile studio. Heading through Manchester to perform at Sankeys on 17th April, then onto Paris’s Zig Zag on 18th, DGTL festival in Amsterdam on 19th and ending at an all day open air event at London’s newest club, Studio 338 on Easter Sunday 20th April, this special Carnival themed excursion has promised live streams, daily blogging and round the clock entertainment. The shows and bus will feature live material from the likes of PillowTalk, Nick Monaco and Slow Hands (each showcasing material from their 2014 albums) as well as performances from the likes of Soul Clap, who are about to release collaborative material with Parliament’s George Clinton and give a taste of the first official Crew Love album set in production for later this year. Crew Love is a collection of artists behind the US labels Soul Clap, Wolf + Lamb, Wolf + Lamb Black, Gator Boots and Double Standard. The new subscription site will give access to all releases on the labels as well as exclusive tracks, DJ sets and Crew Love radio for $9 a month. Prior to embarking, they will also stage shows at Watergate in Berlin and Elita festival in Milan. Future dates for 2014 include festival take-overs at WMC in Miami, Moogfest in North Carolina and Barcelona’s Sonar. Right here is the perfect webpage for everyone who would like to find out about this topic. You realize so much its almost tough to argue with you (not that I really would want to�HaHa). You definitely put a brand new spin on a subject which has been discussed for decades. Great stuff, just excellent! I'm amazed, I must say. Seldom do I encounter a blog that's equally educative and amusing, and let me tell you, you have hit the nail on the head. The problem is an issue that too few men and women are speaking intelligently about. I'm very happy I came across this during my search for something relating to this.